I’ve always felt that the Ruby community and the tabletop game design community had a lot in common, and a lot to learn from each other. Both are all about testing. All about iterative development. Both communities are collegial, creative, and fun. But the Ruby community, and the software development community generally, has a lot to teach us game designers about how to develop something. Ruby has a “way” of doing things that is unique and helpful to game designers. In this series of guides, I’ll introduce you to Squib’s key features and I’ll walk you through a basic prototype. We’ll also take a more circuitous route than normal so that I can touch upon some key design principles and good software development habits so that you can make your Squib scripts maintainable, understandable, flexible, and changeable. Squib is all about being able to change your mind quickly. Change data, change layout, change artwork, change text. But where do we start? What do we work on first? The key to prototyping tabletop games is playtesting. At the table. With humans. Printed components. That means that we need to get our idea out of our brains and onto pieces of paper as fast as possible. But! We also want to get the second (and third and fourth and fifth…) version of our game back to the playtesting table quickly, too. If we work with Squib from day one, our ability to react to feedback will be much smoother once we’ve laid the groundwork. See Install & Update for more details. This guide also assumes you’ve got some basic Ruby experience, and you’ve got your tools set up (i.e. text editor, command line, image preview, etc). See The Squib Way pt 0: Learning Ruby to see my recommendations. Let’s start with an idea for a game: Familiar Fights. Let’s say we want to have players fight each other based on collecting cards that represent their familiars, each with different abilities. We’ll have two factions: drones and humans. Each card will have some artwork in it, and some text describing their powers. Go ahead and put “Familiar Fights” as an idea for a title in the IDEAS.md file. If you’re using Git or other version control, now’s a good time to commit. See Squib + Git. Line 1: this code will bring in the Squib library for us to use. Keep this at the top. 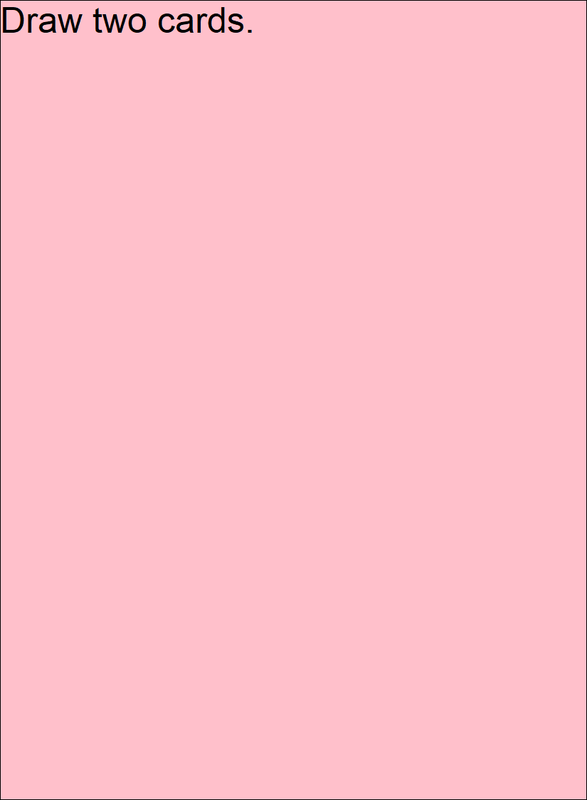 Line 4: Set the background to pink. Colors can be in various notations - see Specifying Colors & Gradients. Line 5: Draw a rectangle around the edge of the deck. Note that this has no arguments, because Parameters are Optional. Line 6: Put some text in upper-left the corner of the card. Now let’s incrementally convert the above snippet into just one of our cards. Let’s just focus on one card for now. Later we’ll hook it up to our CSV and apply that to all of our cards. You may have seen in some examples that we can just put in x-y coordinates into our DSL method calls (e.g. text x: 0, y: 100). That’s great for customizing our work later, but we want to get this to the table quickly. Instead, let’s make use of Squib’s feature (see Layouts are Squib’s Best Feature). Black-and-white. We’re now only using black or white so that we can be printer-friendly. Safe and Cut. We added two rectangles for guides based on the poker card template from TheGameCrafter.com. This is important to do now and not later. In most print-on-demand templates, we have a 1/8-inch border that is larger than what is to be used, and will be cut down (called a bleed). Rather than have to change all our coordinates later, let’s build that right into our prototype. Squib can trim around these bleeds for things like showcase, hand, save_sheet, save_png, and save_pdf. See Always Have Bleed. Title. We added a title based on our data. layout: ‘foo’. Each command references a “layout” rule. These can be seen in our layout file, which is a built-in layout called economy.yml (see ours on GitHub ). Later on, we can define our own layout rules in our own file, but for now we just want to get our work done as fast as possible and make use of the stock layout. See Layouts are Squib’s Best Feature. See that the str: option has an array, and put 'Zombie' on the first card and 'Robot' on the second. See that the layout: option is NOT an array - so it will use the same one for every card. Ok back to the game. We COULD just put our data into literal arrays. But that’s considered bad programming practice (called hardcoding, where you put data directly into your code). Instead, let’s make use of our CSV data file. The file _output/output.pdf gets created now. Note that we don’t want to print out the bleed area, as that is for the printing process, so we add a 1/8-inch trim (Squib defaults to 300ppi, so 300/8=37.5). The save_pdf defaults to 8.5x11 piece of landscape paper, and arranges the cards in rows - ready for you to print out and play! If you’re working with version control, I recommend committing multiple times throughout this process. At this stage, I recommend creating a tag when you are ready to print something out so you know what version precisely you printed out. Squib’s job is done, for at least this prototype anyway. Now let’s print this sheet out and make some cards! A paper trimmer, rotary cutter, knife+steel ruler - some way to cut your cards quickly. Print your cards out on regular office paper. Cut them along the trim lines. Also, cut your cardstock (maybe a tad smaller than 2.5x3.5) and sleeve them. I will often color-code my cardstock backs in prototypes so I can easily tell them apart. Put the cards into the sleeves. You’ve got your deck! Now the most important part: play it. When you think of a rule change or card clarification, just pull the paper out of the sleeve and write on the card. These card print-outs are short-lived anyway. When you playtest, take copious notes. If you want, you can keep those notes in the PLAYTESTING.md file. We’ve got a long way to go on our game. We need artwork, iconography, more data, and more cards. We have a lot of directions we could go from here, so in our next guide we’ll start looking at a variety of strategies. We’ll also look at ways we can keep our code clean and simple so that we’re not afraid to change things later on.